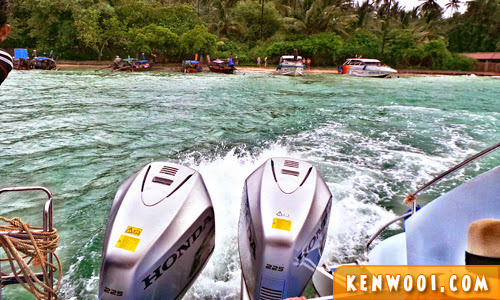 One of the popular activities during the Phuket-Krabi trip was island-hopping. At Patong Phuket, we went for the Phi Phi Islands Tour. 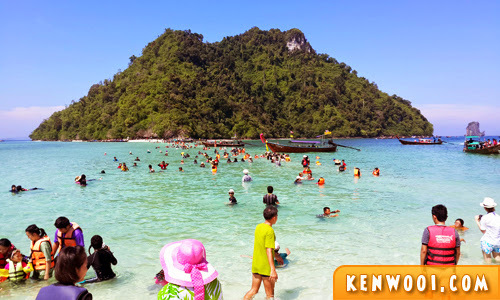 So during our stay at Krabi, we went for our first island tour with Krabi 4 Islands Tour which covers four islands, namely Tup Island, Mor Island, Chicken Island, and Poda Island. 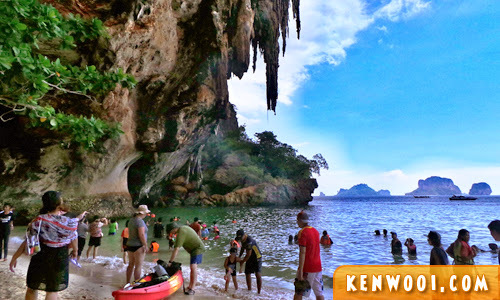 The tour also stops at Phra Nang Cave Beach. 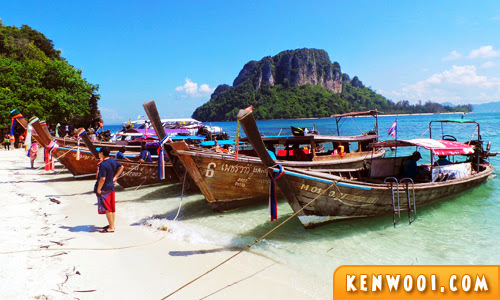 Quick Review: Krabi 4 Islands Tour is an enjoyable excursion. The service is commendable and the tour guide is helpful and knowledgeable. 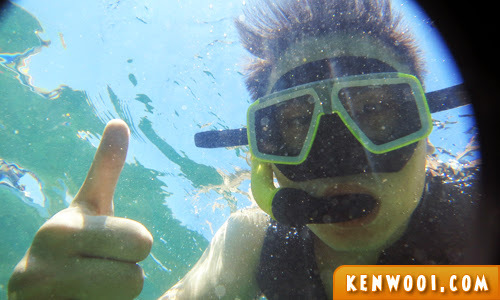 The only downside is the snorkeling session where the seabed isn’t a beautiful sight. It was our first time on this islands tour, and it definitely didn’t disappoint us. 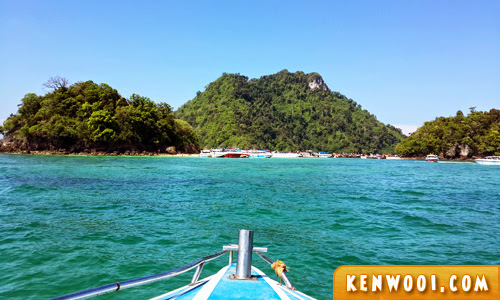 We really enjoyed the tour and it was breathtaking to explore the islands at the Andaman Sea. 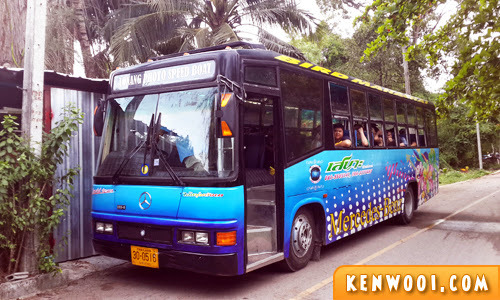 The tour can actually be booked online beforehand, but we opted to book the tour package only when we’re at Krabi. On our first day, we explored the streets of Ao Nang immediately after checking in to Aonang Cliff Beach Resort, our hotel at Ao Nang. 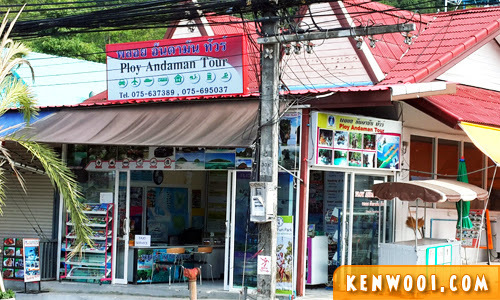 After visiting a couple of tour agencies and comparing prices, we decided to go with Ploy Andaman Tour because it gave us the best price. Obviously. 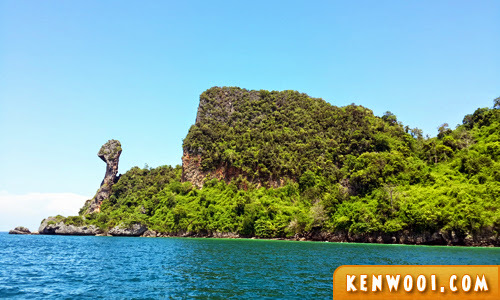 Travel Tip: The price of Krabi 4 Islands Tour by Speedboat stated online is THB1,100 (RM113.08) and it’s quite standard across multiple websites. At Ao Nang, a few agencies quoted THB800 (RM82.24) but we managed to get THB750 (RM77.10) after some negotiation. There are in fact many tour agencies that provide the same tour. 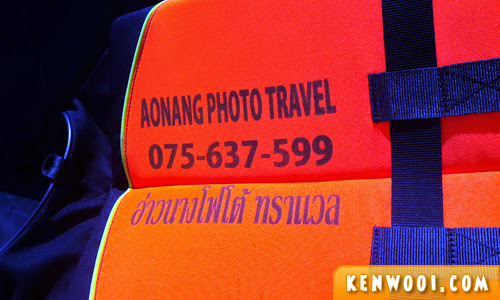 The one we signed up for was with Aonang Photo Travel. 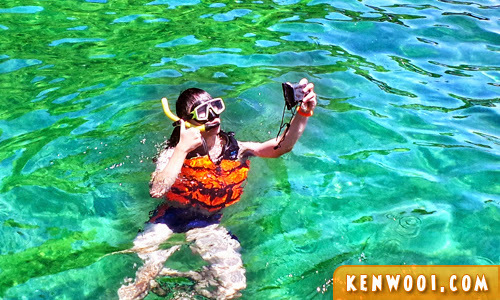 The tour package typically includes basic necessities such as drinking water, snorkeling gear, and lunch. It comes with hotel pick-up and drop-off as well. On the morning of the tour (the next morning), we waited at the hotel lobby. We were told that the pick-up will arrive between 8.15am to 8.30am. As the clock ticked pass 8.30am, I started to be anxious and was wondering whether if I had been scammed. We were picked-up by a travel bus and was brought to Nopparat Thara Pier, the jetty where we’ll be departing from Ao Nang. After being grouped and briefed on ground, we proceeded to the speedboat. A 2-engine speedboat was used during our trip, and there were about 30 people on the boat. The tour started at about 9.30am. 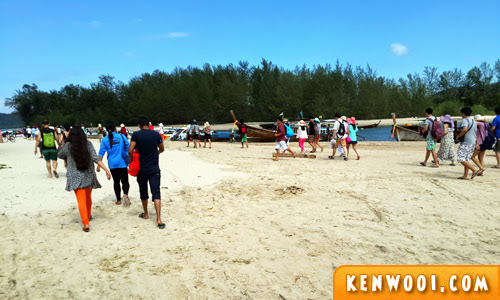 The first destination was Tup Island (Koh Tup) and Mor Island (Koh Mor). At Tup Island, you’ll be able to see various longtail boats lined up along the beach. The sea was beautiful, the sun was scorching hot, and there were many, many, people on that small island. During low tide, the sandbars that link Tup Island, Mor Island, and Chicken Island will be visible and visitors will have the opportunity to walk on them to the other islands. Unfortunately when we were there, the tide wasn’t low enough. Still, it doesn’t stop people from trying to cross over to the other island. The next stop was Chicken Island (Koh Gai), which is nearby Tup and Mor Islands. Chicken Island got its name from a rock jutting out from the ground. Yeap, that resembles a head of a chicken. 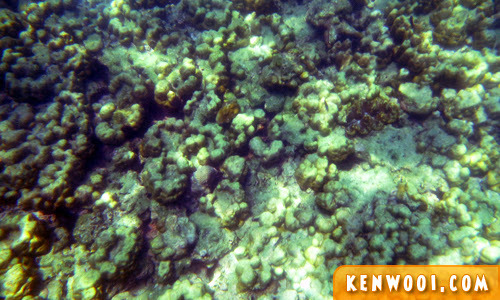 After that, we were brought to an area nearby for snorkeling. I was pretty excited to be snorkeling again, as the last time I snorkeled was dated back in 2009. It wasn’t a view that I expected. The sea water was murky, the seabed was all stones, and the fishes weren’t colorful. Anyway, we stopped by at Chicken Island for a picnic lunch later on. 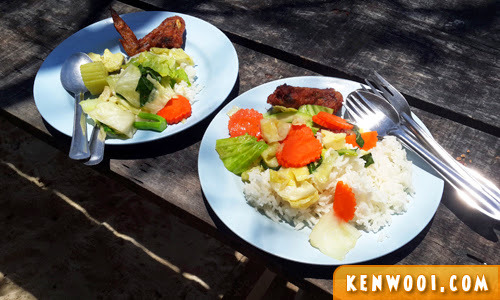 We queued for lunch and the choices of food are simple – don’t expect exotic Thai food to be served. White rice, mixed vegetables and a piece of chicken – that’s pretty much it. Nevertheless, it was relaxing to be eating away on an island without any worries about the world. I even managed to have a quick swim at the beach. Really relaxing and fun. Next up, the tour brought us to Poda Island (Koh Poda), an island located north from the first 3 islands. 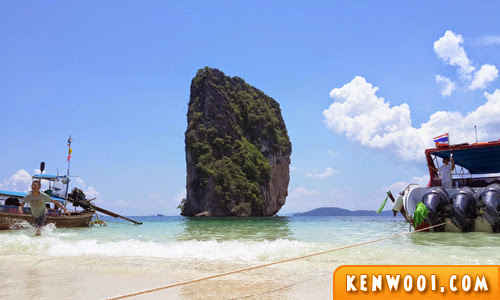 Poda Island is known for its white beach and the huge rock in front of the beach. There wasn’t anything much to do here, except to enjoy the white sand, clear water and blue sky. The last stop was Phra Nang Cave Beach. It’s located at Railay, a peninsular at the bottom of Krabi mainland. We were led by the tour guide through the pathway in order to reach the Phra Nang Cave Beach. Besides swimming, there were rock-climbing activity as well. Some even had a canoe to paddle around the beach. Basically, it was just a quick stop there. The view was nice, but it’s just too crowded. The tour ended at 2.30pm as we set back to Nopparat Thara Pier. Every one was then sent back to their respective hotels by the same bus. Overall, I really enjoyed this tour. The service was commendable, the tour guide was helpful and knowledgeable, and the boat crew didn’t “demand” for tips – unlike Sea Angel’s Phi Phi Islands Tour. 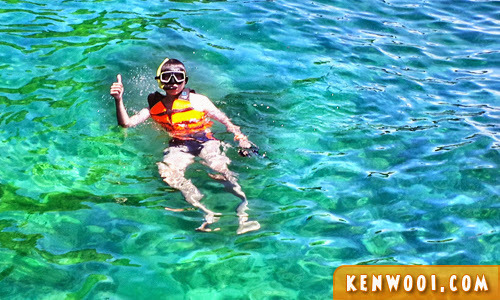 I’d give a thumbs up and it’s definitely recommended to explore the Krabi islands when you’re there. The only downside was the snorkeling session where it wasn’t fantastic at all. It would have been great if the seabed was beautiful. Unfortunately the tsunami back in 2004 may have destroyed the marine life. Oh wait wait… this is even better…! Alright, if you’re interested to know the exact locations of the Krabi 4 islands and Phra Nang Cave, here’s a Google Map for your reference. Oh what a disappointment go snorkelling but can’t find corals!